What Are VAM Morgan and Peace Silver Dollar Die Varieties? A VAM is a Peace, or Morgan silver dollar die variety that has been identified in an all-inclusive book called The Comprehensive Catalog and Encyclopedia of Morgan and Peace Dollars by Leroy C. Van Allen and A. George Mallis. The term VAM derives from the first initials of Van Allen's and Mallis' last names. These two researchers noticed differences between coins produced in the same year and at the same mint. They began to photograph and catalog these differences to identify the different die varieties in the Morgan and Peace silver dollar series. Some of these differences can be seen without magnification. Other ones are so small you need a high-powered loupe or microscope to see it. The enormous popularity of noting the many die varieties found, especially on Morgan Dollars, has led to the term VAM being used to describe practically any deviation from a "normal" Morgan or Peace silver dollar for that year and mint. It is now common language among coin collectors that people talk about having found a "VAM" when the variety they are referring to has not been assigned a VAM Number. The United States Mint creates coins by striking a planchet between two hard metal coin dies. Due to the tremendous pressure and stress on the coin dies from each strike, the coin dies have a limited working life. Therefore, each mint facility uses multiple coin dies every year to produce the coins. Die varieties can happen at two different times during the minting process. The first opportunity for a die variety is during the production process of the coin die. Mint workers manufacture each coin die from a coin hub that has an exact image of the coin. The coin hub is used to produce a coin die that is a mirror image of the coin design. Although the United States Mint strives to produce every coin perfectly, some minor errors or imperfections occur. These can be slight differences in the design or imperfections on the coin die itself. The second opportunity to produce a die variety is during the maintenance of the coin die. 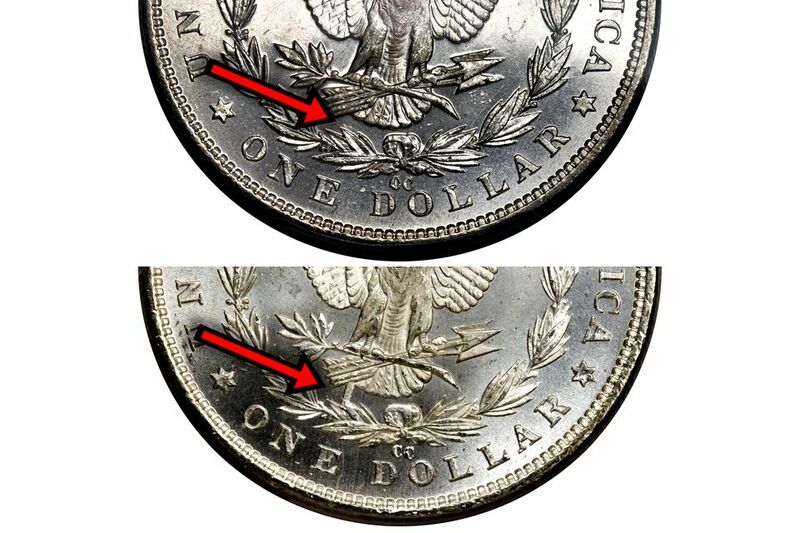 During the production process, mistakes can result in abnormal wear or slight damage to the coin die such as scratches or die cracks. Mint workers will try to prolong the life of the coin die by removing the error or damage through tooling or polishing the die before it is returned to production. Unfortunately, this process will lead to slight variations in the coin die. Some of them are pronounced and visible to the naked eye. Others are only identifiable under magnification. Van Allen and Mallis' goal was to catalog every die variety of Morgan and Peace Silver dollars. To do this, they created a cataloging system for each date and mintmark combination. Each die variety is numbered sequentially as coin collectors and researchers discover it. "VAM-1" is always assigned to the normal die state for a particular year and mint mark combination. As coin collectors and researchers discover more die varieties, the authors increase the catalog sequentially. For example, VAM-2, VAM-3, etc. You may also notice that letters are added to the end of the VAM designation to indicate various die states. For example, a VAM may have been created in the production of the coin die which resulted in it being this discovered and cataloged as VAM-5. Subsequently, a mint employee may have removed the die to perform maintenance on it and added another unique identifier to it. The authors with then catalog this die variety as VAM-5A for that particular year and mint mark combination. The sequencing of letters only indicates the order in which they were discovered. It does not indicate the age of the coin die used in production. It is the "thrill of the hunt" that drives most coin collectors on their collecting journey VAM collectors strive to complete their collection with as many different die varieties as possible. Additionally, they may crave the recognition of discovering a new VAM. Experts catalog all the VAM die varieties at the VAM World Website. This website is dedicated to researching, sharing information, cataloging and photographing VAMs from both the Morgan and Peace silver dollar series. Start by reading the introductory articles that introduce you to the VAM cataloging process. There are also a series of articles for beginners. VAM World contains a wealth of information that can help you identify VAM's so you can start collecting them yourself. Who knows, you may discover the next VAM for particular date and mintmark combination.